The Kinova MOVO is designed to aid researchers by enabling them to discover innovative approaches and applications for mobile manipulation. 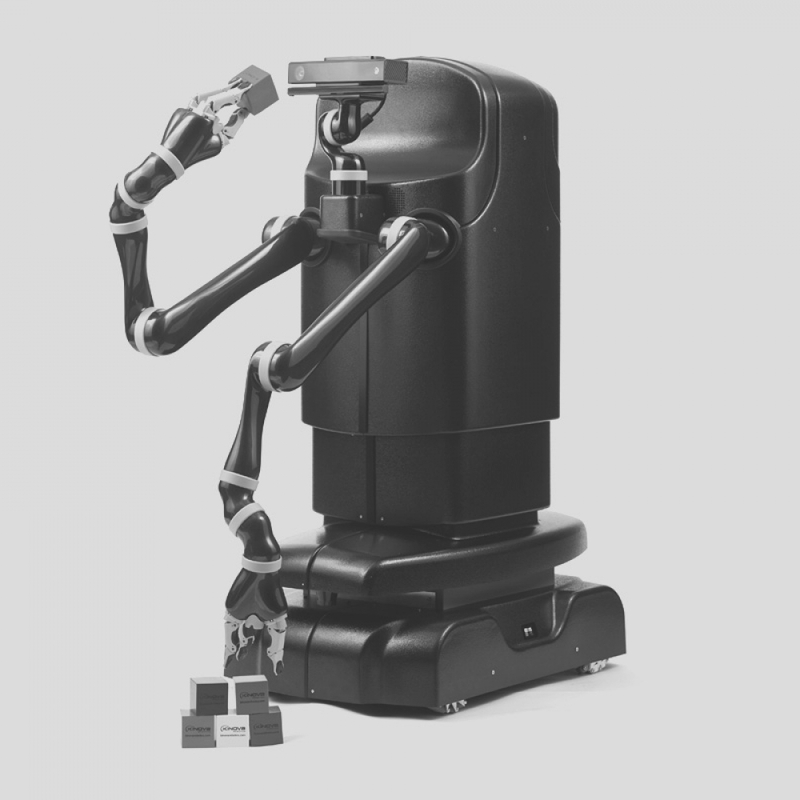 MOVO has been fully designed and developed using the Robot Operating System (ROS), along with MoveIt! and Gazebo, and offers an application programming interface (API) that will provide researchers the most advanced functionality in all areas of robotics. The EMOTIV EPOC is a revolutionary Brain Computer Interface offering a high resolution, multi-channel, portable system which has been designed for practical research applications, provides access to dense array, high quality, raw EEG data from the Neuroheadset and a proprietary software toolkit that exposes several detection libraries: Mental Commands, Performance Metrics and Emotional States and Facial Expressions. The Kinect for Xbox One is a device that can be utilized by the console’s user interface and games, providing a motion controller system that uses an infrared array to detect the presence and motions of players, a speech recognition system, and a microphone and video camera that can be used to record and stream video footage. The new Kinect features improved motion tracking and voice recognition functionality over its predecessor, including a wider field of view, the addition of a 1080p resolution camera, the ability to track up to six bodies at once, and the ability to track a player’s heart rate amongst other features. The device features a 512×424 pixel time-of-flight camera; the new sensor has an increased field of view, reducing the amount of distance needed between the player and the sensor needed for optimal Kinect performance. In comparison to the 2.4 m minimum of Kinect for Xbox 360, Microsoft recommended a minimum distance of 1.37 m.
The AscTec Pelican is a quadrotor aerial vehicle. It is equipped with a high performance onboard processors, and a wide set of sensors: 3 accelerometers, 3 gyroscopes, 3 magnetometer, GPS receiver, 3 high quality cameras and a precise laser scanners. It is programmable via AscTec SDK and AscTec Simulink toolkit. All in all this flight system is the most flexible and powerful of the Ascending Tecnologies fleet. The team is composed by 5 Khepera III mobile robots and a base station. Each robot and the base station have on-board a Korebot II board with a basic linux os that allows to execute autonomous navigation algorithms. The default equipment of the robots is composed by several infrared sensors, 5 sonar and a wifi communication device. Moreover, depending on the specific mission, the robots can be equipped with on-board usb webcam, or with an Hokuyo URG Laser Scanner. The robots are used to test decentralized control algorithms for multi-robot systems. The team is composed by 7 khepera II mobile robots manufactured by K-Team. Each robot has a unicycle-like kinematic structure and some infrared sensors. Each robot has an on-board processor to run simple control algorithm and a bluetooth radio turrets to communicate with a remote unit. The robots are controlled by a linux-based remote unit that uses robots’ positioning information (received from Windows-based vision system) to run the control algorithm, and to generate the velocity commands to the robots’ wheels. The team has been widely used to test control algorithm for multi-robot systems, e.g., to achieve formation control, entrapping/escorting of autonomous targets, flocking, keeping a MANET communication network. The Lego Mindstorm Kit has been used for didactic purposes. In particular the kits have been used to allow high-school students to assemble an autonomous vehicles and to develop a basic control algorithm to make the robot following a black path on the ground.